Set in the beautiful Aratiatia Scenic Reserve is New Zealand's best white water Jet Boat ride. 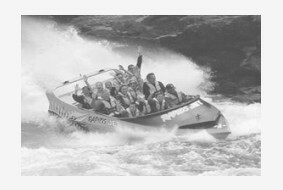 Rapids jet boast the biggest rapids for commercial Jet Boating in New Zealand and make it look easy. Shoot through narrow canyons, be exhilarated by the spin on crystal clear waters, spot trout and surf the foaming tail of the awesome Nga Awapurua Rapids. Warm clothing, a good jacket & woolly hats and gloves in winter. Age: Unsuitable for under 5 years. Two of Taupo's best New Zealand owned and locally operated adventure companies, have joined forces to offer you the most exhilarating Water and Air experience you can get in New Zealand. The combo includes a 35 minute Rapids Jet ride with a FREE photo Pack and a 12,000 feet skydive with a FREE T shirt. Transportation is available to Skydive Taupo and own transport is required to Rapids Jet. Please note a 100kg weight limit applies for the Skydive. Unsuitable for 13 years and under. 100 kg weight limit. Enjoy the thrills of Rapids Jet and then Experience Tongariro Rivers best Grade 3 white water action in New Zealand! You'll raft over 50 exciting Rapids, travelling 14kms through a beautiful volcanic gorge. Explore a really cool (literally) hidden waterfall (jump optional & weather permitting) and a hot chocolate with snacks to help unwind after a full on day. Afterwards, enjoy your hot solar powered shower before refuelling with your complimentary "River Dog" (hot dog) and cold beer or soda while you view your FREE trip photo's. In Summer, October-April, you can do this combo in 1 day, and in winter it has to be over two days.